Attention engineers and science fiction fans. Know a lot of robots? How many can you name? 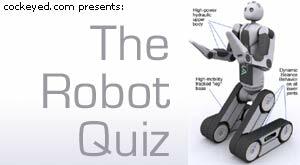 Think you can identify 40 robots? I don't think anyone can, but maybe you could get half of them. I await your results. What is this Robot's Name? This would have been a funny place to put a picture of your ex-boyfriend.